Who around here thinks that the .22 WMR doesn’t get the love it deserves? Well, a show of hands probably won’t help here, but it certainly has a lot to offer the shooter. Lots of punch but not quite the reach of the centerfire .22s, capable of excellent accuracy and very capable of dispatching varmints up to and including coyotes. So why the lack of appreciation for the WMR? Tough to say, although it probably has a lot to with shooters wishing to stick with a centerfire caliber if they are going to pay centerfire prices for ammo (let’s face it, WMR is not cheap like .22 LR). AR pattern rifles are everywhere and are dirt cheap, and the ammo is cheap, too. But sometimes it is...excessive. You don’t always need to shoot a caliber that breaths fire all the time. 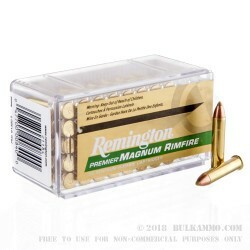 The .22 WMR is still small enough that it can be fired using smaller rifles which are light and easy to keep on hand in the truck or garage for varmint duties, and they are still quite a lot less expensive than even a very entry level AR, all while carrying roughly 2/3 the velocity of a 55 grain .223 slug. Remington 33 grain Accutip maximizes the effectiveness of the WMR by blazing along at a scorching 2,000 fps and carrying a very hefty 293 ft. lbs. of energy! That is in the ballpark of a .38 Special in terms of muzzle energy for reference so it will easily dispatch varmints. 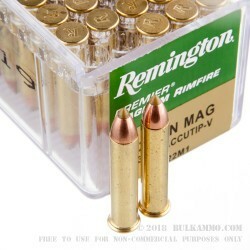 Get off the fence about adding a .22 WMR to your lineup if you don’t have one, and if you do then start feeding it some high-end, thoroughbred Remington Accutip-V 33 grain cartridges! Pick them up now before they are gone. 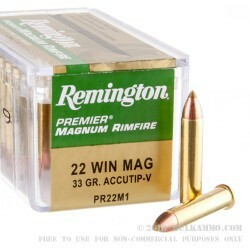 great ammo but might as well shoot my 223 for this price! Q: Will this ammo work with a Ruger 10/22? A: The majority of Ruger 10/22 rifles are chambered for .22 Long Rifle (LR) and will not work with .22 WMR ammunition. The proper caliber will be marked on the receiver of the Ruger 10/22. Ruger previously made the 10/22 chambered in .22 WMR but has since discontinued these models and they are very rare. If your receiver indicates that your rifle is chambered for .22 LR then you will want to only shoot .22 LR ammunition through it.